The theme of the Christmas card revolved around the the use of a pun on the front of the Christmas card – “Very Berry Christmas” and from that all the illustrations and graphic design elements that I added to the card were related to the word “berry”. 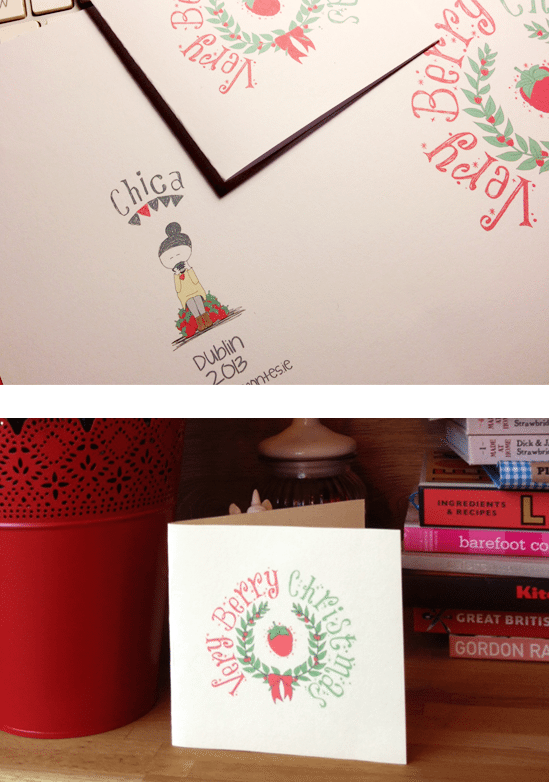 The berry theme was used throughout the whole design, the front of the card with a Christmas wreath with lots of berries and on the back of the card I put a little girl (who for now has the title of “Chica“) sitting on berries sipping some berry tea. 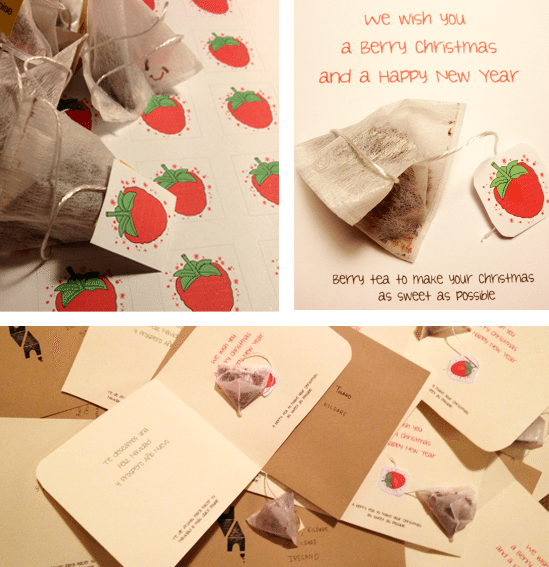 I included a berry teabag in each of the cards as well for family and friends – a sweet treat to warm them during the long cold days of winter. I bought a nice berry tea and I swapped the brand label for a customized label and then I lightly glued it to the card as you can see in the image. Christmas cards were sent and I received lovely messages from my friends and family about the card and its design. This was a personal project but I enjoyed the whole process: the illustrations, finding the right berry tea (which, incredibly was the hard part of the whole project), the packaging and the delivery. Even though that Christmas has just passed it’s still the festive season so I guess I just have to wish you a “VERY BERRY CHRISTMAS & HAPPY NEW YEAR”. 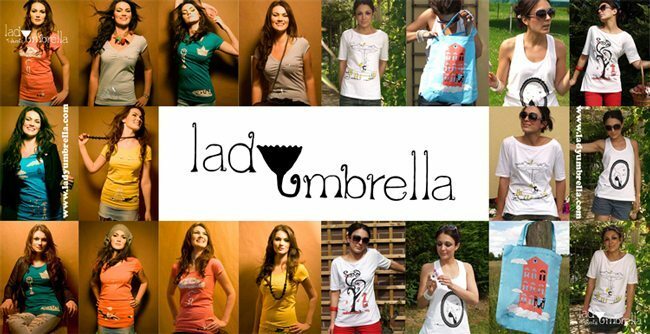 LadyUmbrella was my first project as a graphic designer and fashion designer. It was in 2007 when I started drawing my first sketches of LadyUmbrella (a lady with an umbrella as a head) and did her logo design and I’ve been drawing her ever since. The brand has been developed throughout the years and we tried with every collection to look ahead and introduce new styles and designs. LadyUmbrella was on a hiatus for more or less the for 2 years. We had a little break, but to be honest, this break helped me to see things a little bit more clearly about how I wanted to develop the brand and something that I realized that I needed to change about the branding was the LOGO design. The brands new collections developed with simpler illustrations which were more abstract and minimalistic. The bright colors which were indicative of the brand when we launched the first few collections are still there but more refined. This change in brand direction is what prompted me to develop a new logo. For the last few months I’ve been working on our Spring/Summer collection for the next year and came across a beautiful font (you know I love fonts right?) that I thought reflected the new LadyUmbrella. As you can see the font is clean and sharp but with some rounded shapes that aligns with the LadyUmbrella brand ideals of simplicity and naturalness. From there, I started to developed the logo. I added two small illustrations: one of them is a twist on the old logo design (the umbrella graphic) and I introduced a new element, the drop of water, that sits beside the umbrella, to balance the design. The drop of waters shape – as you can see below – has been taken from the A from the logo as I was trying to find a better balance between all the elements. ….and after going back and forth couples of times, the logo become alive. I decided to use just 2 colors for the final logo, black and pale blue, and I made the thickness of the stroke on the font a bit bigger to make it clearer and more visible. Finally I attached the 2 little icons (drop of water and umbrella) below the font. 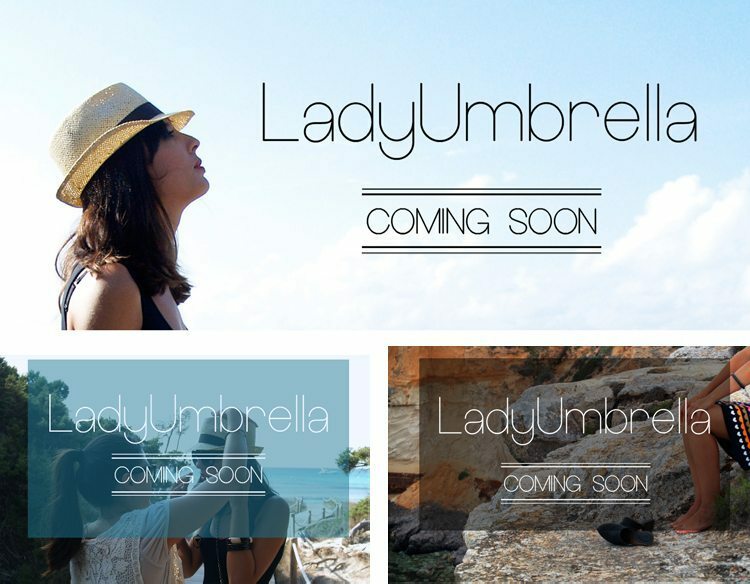 As a I said I was always looking for simplicity and I think I found what I wanted to represent the New LadyUmbrella. With all logos I think is important that there is a smaller more minimalised small version of the main logo.This smaller logo, the evolution of which is pictured to the right, can be used throughout out all branding and eventually reconisable by itself. All mayor brands hope to be reconised by smallest or just one element of their logo design and I hope that in time this blue drop and umbrella will stand alone by themselves to represent LU and LadyUmbrella. 1. 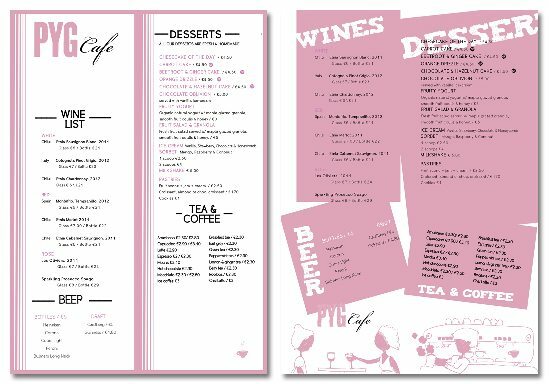 Durable: The Pyg Cafe menu is being printed on heavy paper and laminated with a matt finish (there is a choice of gloss lamination also) but the matt finish gives the menus a more professional finish and helps to keep them somewhat dry (not easy in a busy cafe!). 2. Clear, easy to understand: I divided the menu in different section and used dividers to make it easier for the customer to find and choose what they want quickly. For the menu I used 2 different fonts: Savoye LET and Whipsmart to create dynamism but I chose Whipsmart to be the main font as it’s clear and simple. 3. Eye catching: The cafe is located in the middle of Powerscourt Townhouse (South William Street, Dublin) and it is an open plan Cafe so people can see the Cafe from anywhere. Due to this fact it was important that the menu was attractive from a distance. It’s main purpose is as a menu but if it can also attract the attention of people that pass by then that’s an added bonus. This is the reason why I decided to use the contrasting bold pink and black backgrounds so that as people pass by the colours just might catch the corner of their eye. 4. 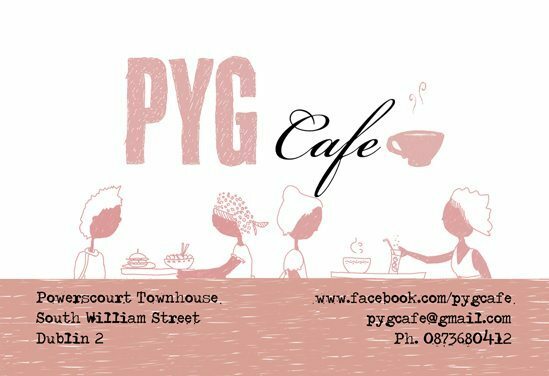 Brand aligned: I’ve been doing the design for Pyg Cafe for the last 3 or 4 years so I always try to keep the same style all the time so people can identify the design with the brand (although I always try to improve the designs). One of the elements that link all the menus is the PINK color. 5. 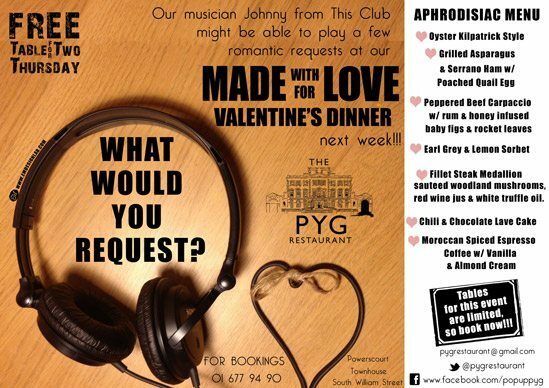 Effectiveness: When I met the manager of Pyg Cafe to discuss what he was looking for in this menu he said he wanted it to really entice and engage people so that the cafe could sell more drinks and desserts (they currently do very well on their lunch menu). 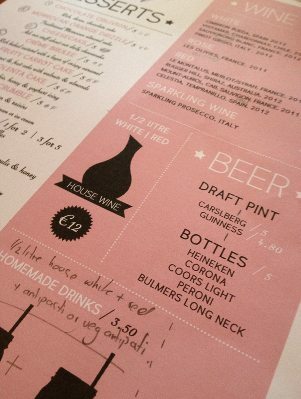 To try liven up the menu to grab peoples attention I decided to add some shapes, like a carafe and a jam-jar. 6. 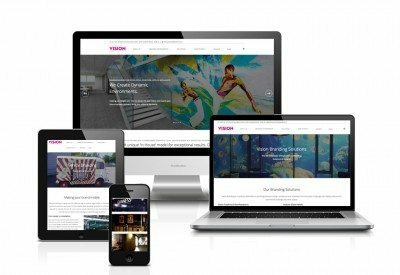 Put some graphic design into your business: Competition between business is getting tougher and tougher but to make your business to stand above the other ones it’s important to have good graphic design (but, of course I’d say that!). If customers see that you care about the little details, like the design of your drinks and dessert menu for example, you’ll be ahead of your competitors. These websites have a great wide range of fonts that you can download for FREE, so it is time to stop using ARIAL for your designs. You can import the font sets into most programs on your computer so you can even spruce up your Word Docs too! Anyway what I wanted to do was to show you some of my favorite FONTS – at least for right now…trends changes all the time ;) I didn’t want to just list them for you, I wanted to show you how I used them so you can understand that every font has a style and that it needs to balance with the style of the illustration, graphic design or theme. 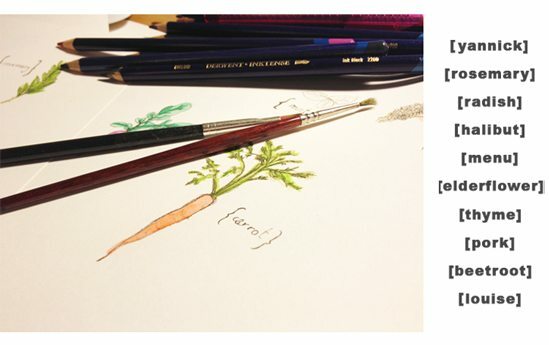 For example for illustrations I use fonts with a more calligraphic style whereas for more clean design with photos I use fonts with clean lines. 1. Channel Left-Slanted: This one is a lovely font that I used for one of the my last projects for LadyUmbrella. It is a very graphic font, almost like a drawing. Suitable for designs with illustrations, comics or drawings. I love this font and I will use it for Little LadyU illustrations but I won’t use it for anything else because I want people to identify the font with Little LadyU and with nothing else. 2. Type-Ra: This is a very classic Font or should I say “vintage” because it is a font that tries to simulate an old school typewriter and that is why I love this font so much. To be honest it is a font that I would like to use more often but it doesn’t work with everything. You need to be cautious when you use it. 3. Whipsmart: I’ve been using this font for the last few months in so many projects that I can’t remember, but I wanted to show you at least one of the projects that I did for Pyg Restaurant with this font. It is a very easy font to use, very easy to read and clean lines. Perfect for menus, brochures, flyers, magazines – in general, graphic design where text is the main thing. Yes, I love this font. 4. Europe Underground: So, what can I say about this font. You will probably recognize this font. I think a lot of designers are using it at the moment. It is clean but with few round shapes which is what I love about it. 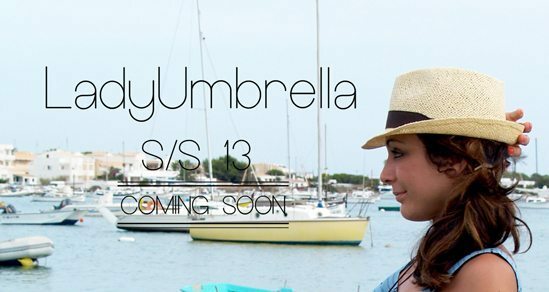 It is perfect for branding and I used it myself for my clothing company LadyUmbrella and my new collection that is coming soon. The only problem I found with this font is that you need to add a little stroke because is too thin and if you don’t add the stroke you can barely see it…but it is a problem with solution. Recently I updated my twitter background design after being advised by Robert Ryan (a social media connoisseur) to do so. He thinks Twitter is a good social network to let people know about your work and promote yourself….so I have to give it a try. Although I’m designing my first personal twitter background, I’ve been doing twitter background design for a while. 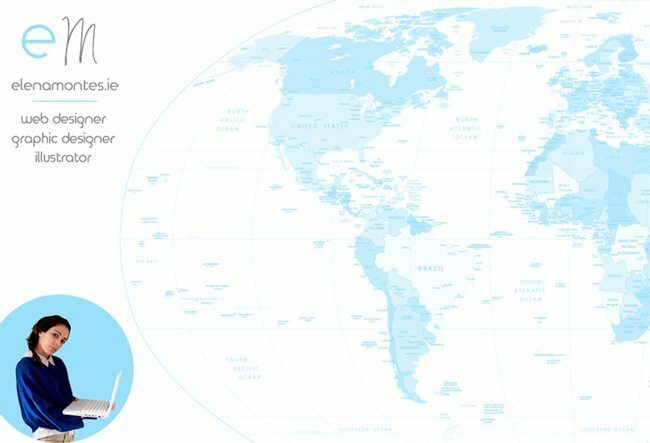 My first twitter background design was for LadyUmbrella.com (my clothing company @ladyumbrellaltd) and then Robertryan.ie (@robertryandotie). They are different types of business and so the twitter background designs are also distinctly different. 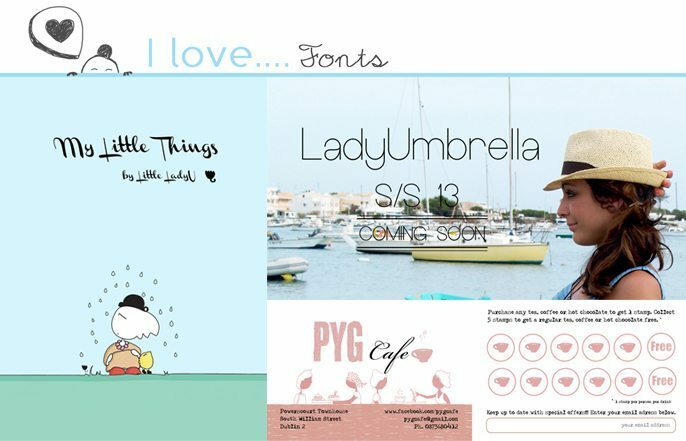 As you can see from the two designs above the LadyUmbrella one is a lot busier visually and displays some of the products that LadyUmbrella offer. The hope here is that one of the t-shirts or designs might pique the interest of a potential customer and so putting the products front and centre was key. The LadyUmrbella design is quite different from the one for Robert which was a lot cleaner and focused on building an identifiable brand for Robert by using the colours that are associated with him. 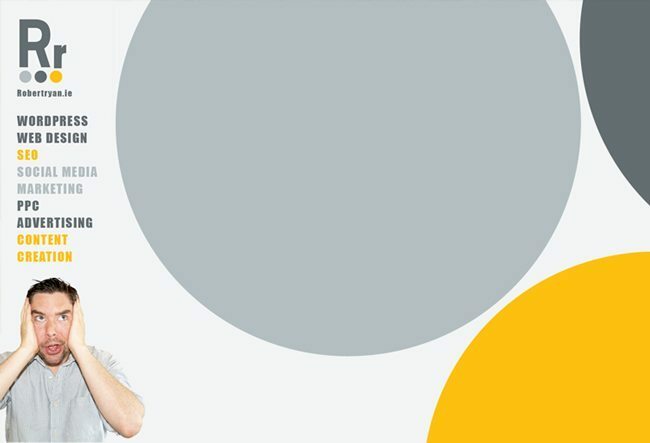 For my own Twitter page I wanted to design a Twitter background with same style as my website. Blues and greys are the main color on my site (same as the logo) and so I chose them as the main colours for my twitter background. Simplicity sometimes is the key to everything. People need to know what you are doing in few seconds, twitter is a social network where people follow people that they interested in and if they don’t find you interesting in a few seconds then they never will. 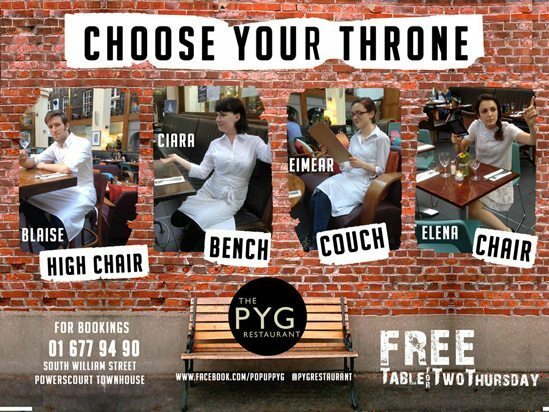 When Pyg Restaurant started with their Facebook competition they knew that they needed great images to catch their audiences attention. In that case a little bit of graphic design needed to be done and so I got on the case…Below you can see of the graphics that I designed for their Facebook competitions. They idea of the Facebook competition was simple – to get as many people as we could taking part in the competition, share the image with their friends and leave comments. That then helped to get more likes on the Facebook fanpage and later more customers in the restaurant. 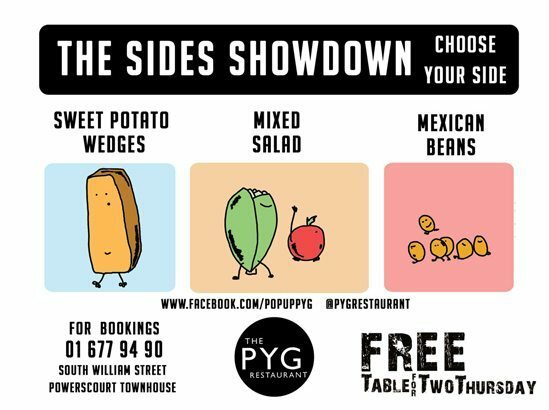 The competitions were usually related to food, dishes from the Pyg Restaurant menu and the competition format was typically for participants to choose one from a selection of three choices. Some weeks competitions with different formats were tried but, unsurprisingly, they weren’t as successful as the simple “pick your favourite”. 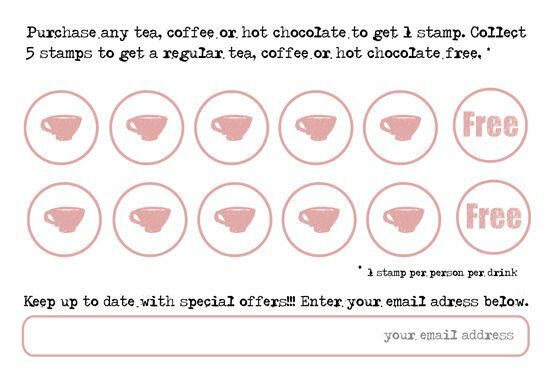 The really enjoyable part of this graphic design job was creating the different images for the Facebook competitions. I was in charge of the graphic design for all of the competitions and so I was able to experiment and try different things. The competitions were every Thursday and to be honest they were weeks that ideas were tough to find or sometimes I was low on pictures, so I needed to go to the restaurant and take more pictures of their dishes, their furniture and also the staff (although not everyone wanted to be an star ;)). Sometimes I drew illustrations if the theme required it or if I felt inspired. The competitions were very successful. 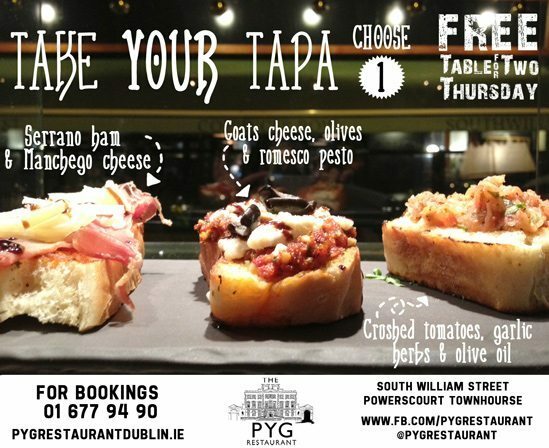 We got lots of entries and everyone (ok…almost everyone) in Dublin heard about “Free Table for 2 Thursday”. 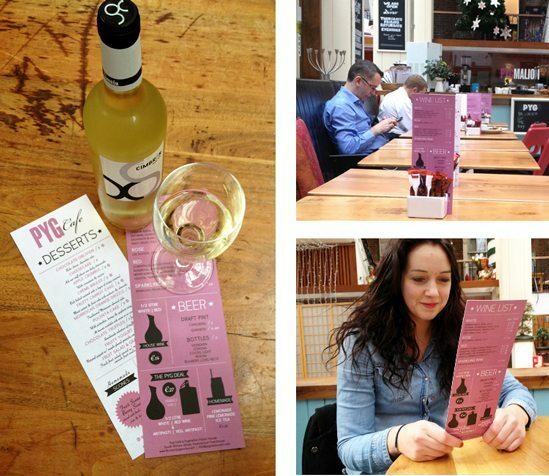 Pyg Restaurant started to get busier and the Pyg Cafe (the restaurant opens as cafe during the day) noticed an increase in business too. This blog is a follow on from an earlier post about the menu design project for Yannick and Louise to show you a few more images of the completed menu design project for Yannick & Louise for their cooking event in Savory Kilkenny. It was a pop up event so they wanted something simple for their menu but at the same time something that would reflect their style of cooking. 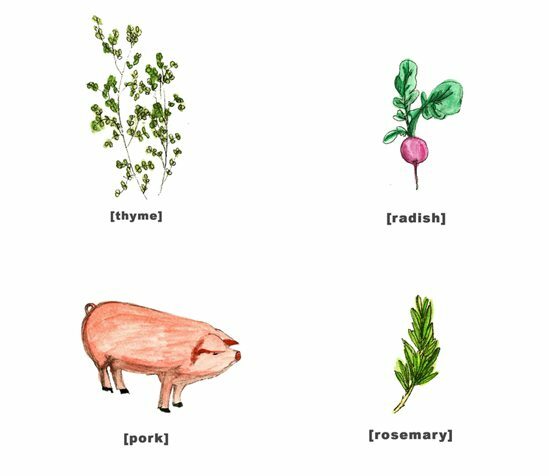 I drew different fresh ingredients like rosemary, radish, thyme and other items that Yannick and Louise might use in the kitchen. I drew 8 different illustrations in total so they have 8 different menus. I like to think that people around the tables will be intrigued and curious about others people’s menus and hopefully that will set the tone for the meal to come. 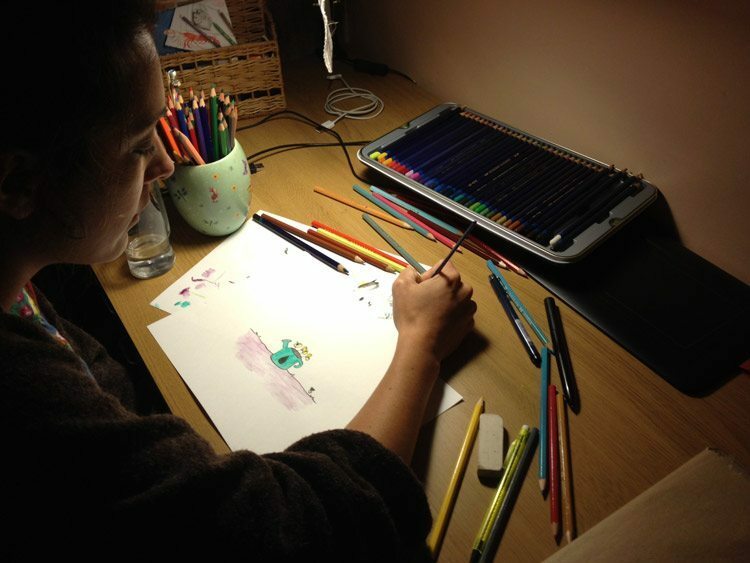 All the illustrations are original and painted with watercolor pencils. I scanned them and I just added a little bit of contrast and brightness in Photoshop but they didn’t need anything else. I really enjoyed this project, I usually spent 80% of my time in front of the computer but this time it was the other way around, 80% with brush in hand and…and I just loved it. So, I’ve had an idea in my head for a while about doing a simple comic strip with a few illustrations featuring my “Chica” character. 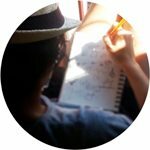 I’ve been a fan of Agustina Guerrero from Argentina and her Diario de una Volatil illustrations for years and figured it was time to do some of my own – maybe some of you guys out there will like it and it’s a new graphic design outlet for me to experiment with tititi. For the last few days I’ve been working on a design project for a Cafe in Dublin where I used to work before…and where I had some good times and good memories. 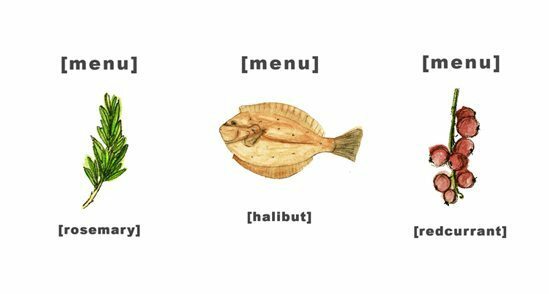 They requested a standing menu design for their tables. They wanted the drinks & dessert menu to display: desserts, pastries, ices creams, wines, beers and few more little things :P To be honest I thought I was going to have to tell them that maybe I wasn’t going to be able to add all of the elements to it, but at the end I was able to fit everything onto the little menu. 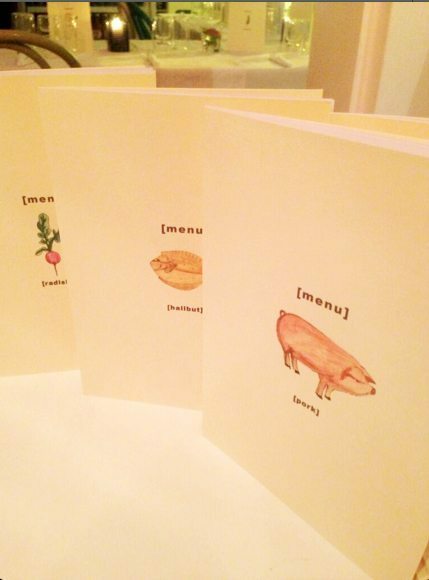 The menu is folded A4, printed on both sides and laminated to give it a longer life. I wanted to show you a little bit of the design process as well, in particular a part of the process that not that not too many people talk about, the “FRUSTRATION. Did you ever get the feeling that the ideas for the design, or whatever you want to create, just won’t come into your head? A feeling like your muse has abandoned you, that whatever you try to draw or design is just sh**!..well you can see some of my “frustration” in the above! For the final menu design I decided to play with 3 colors: black, white and pink (their logo is pink). I added few icons for the carafe, jam jars, banners and added some little stars to the menu to give it a little bit of movement. Images help to send a message and I always try to use as many as I can. The menu is divided into sections to make it easier to read. The final touch of this design was to add a little bit of noise and texture to the background so the colors are not completely plain. 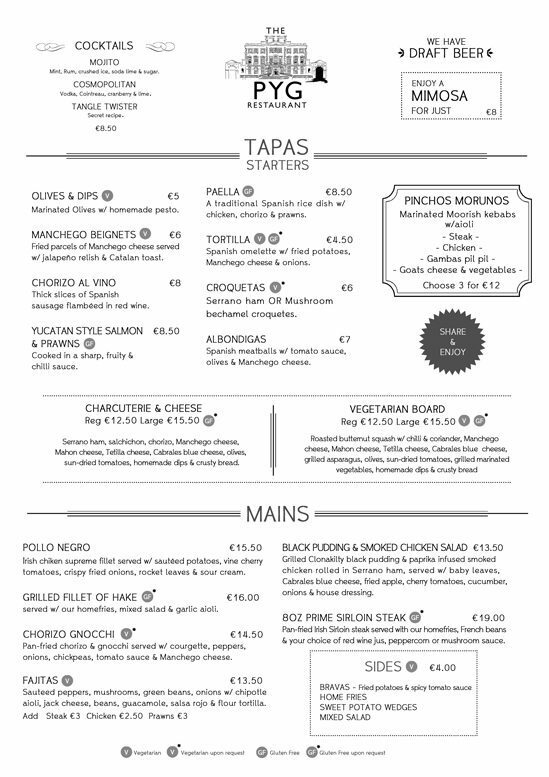 The menu has been presented to the client and just a few changes have been made – adding some new items and changing the colours slightly. I think they were happy with the final design and every time people are happy with my design I feel a big relief. Have a nice day and if you’ve a design project for me please get in touch! For the last few days I’ve been working on a special project that I’m very happy to be a part of. 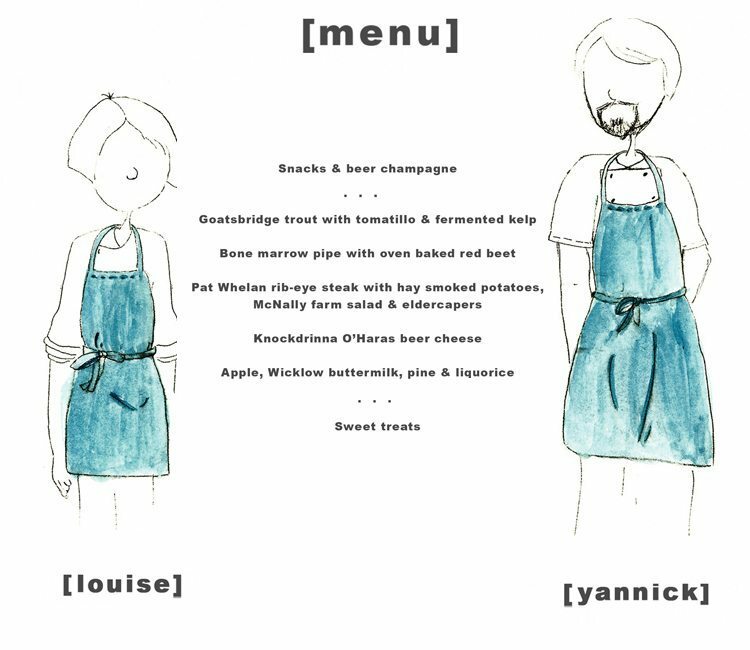 Yannick & Louise (well it was actually just Louise) called me and asked me to design some menus with nice illustrations for a pop up dinner they are going to do in few days. I couldn’t say no to them and it was a great opportunity for me. I had freedom for the design but they told me that they wanted something clean, simple and not over the top – something like their food. I don’t know if you’ve ever heard about Yannick & Louise but maybe you’ve heard about Noma (Michelin star restaurant and winner of The Best Restaurant in the World Award by Restaurant magazine – 3 years in a row!)? Well, Yannick and Louise worked there to learn the craft and then set out on their own. They decided to move to Ireland, where they experimented with Irish ingredients, and I have to say that I very lucky and I was able to try their food. 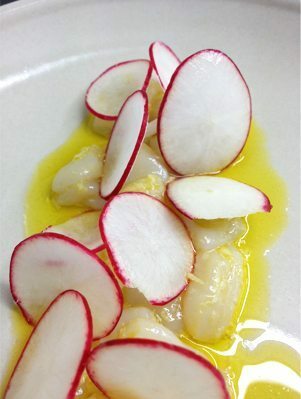 I took a picture of one of my favorite dishes: raw razor clams with horseradish and radish..nom, nom. I decided to use illustrations of different food ingredients used by Yannick & Louise in their recipes. I drew them first and then painted them with watercolor pencil. I then scanned it in to Photoshop where I added some contrast to the illustrations and introduced some text. 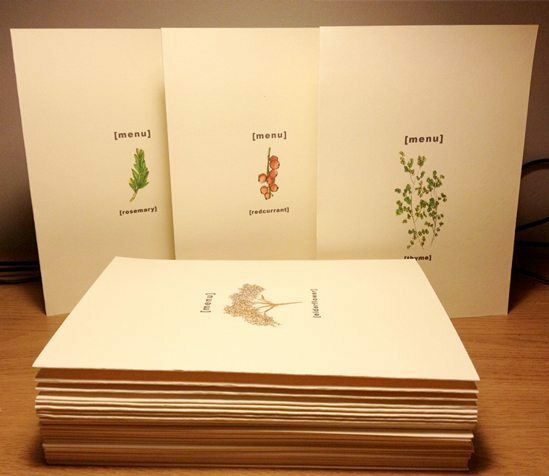 The menu will be printed on A4, 220 grms and folded in half later….The base colour of the paper is cream and it is ever so slightly textured so it will give the finished printed design a great look and feel. My new website is ready….now it is time to work. After working very hard on this website designing the graphics for it, I’m happy to say that I’m now ready for your emails and your projects. I’ll be posting new projects in the blog. I’m working on some projects right now (website design and some printing work), so keep an eye over the next few days for updates! 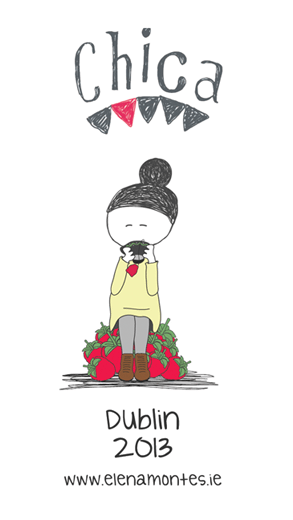 My Little LadyU illustrations, an offshoot of my LadyUmbrella clothing brand, are becoming more than a hobby. 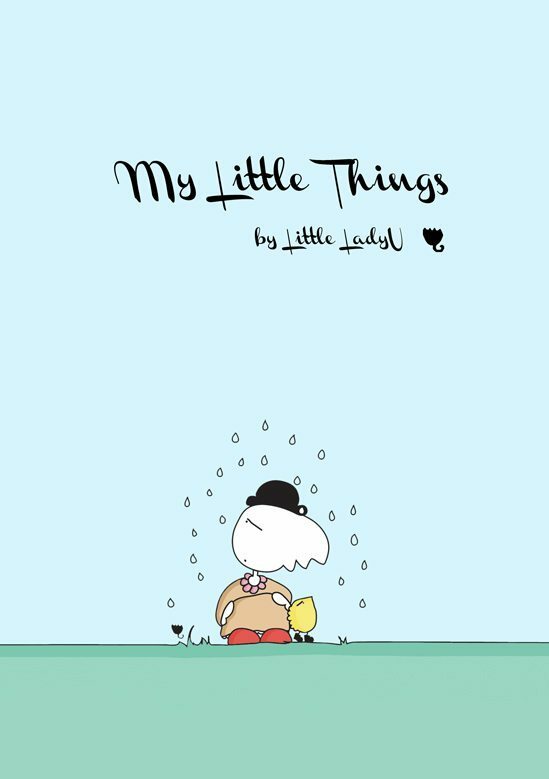 I enjoy creating Little LadyU illustrations to try different illustration techniques to refine my skills but I’ve also embarked on a big print design project with Little LadyU – a 280 page notebook. When not busy with client work I’ve been tinkering with the Little LadyU illustrations and creating the notebook format. And, I’m happy to say, the format is now set and we’ll hopefully be going to print soon.